I wonder if you can divide the world between those who like word searches and those who like crossword puzzles. If you could, there is no doubt that Number 1 Son and I would both fall into the Word Search category. I can do a crossword for just few minutes before I run away. Number 1 will not even look at them. But as Number 1 grew older, I could see that even word searches were no longer capturing his interest. The more words a worksheet had, the less he was inclined to even give it a chance. Now he prefers mazes, no matter how complicated they are. "Only mazes," he would say. I think he feels that there are no annoying letters to make him feel less smart. I now find that I am also steering away from games that require reading but when I first saw Pathwords come out, I was instantly drawn to it. Moving puzzle pieces around with his hands and fingers stimulates him somehow. Even with Simon Flash, his favorite game was not the classic version where the buttons stay in place and a child just pressed the buttons. Rather, he liked Simon Shuffle (my favorite too) or Simon Secret Color because you can move things around with your hands. His memory works better when attached to movement. * But alas, Number 1 was 7 when I found Pathwords (suggested age 12+) and so it was not an option. Puzzles are in a spiral bound book (no losing cards or cards need to be reorganized by number). The pieces can be stored right under book. It won't fall out! But luck must be on our side because Think Fun has released Pathwords Jr. (suggested age 6+) this year. I found it at the Toy Fair. 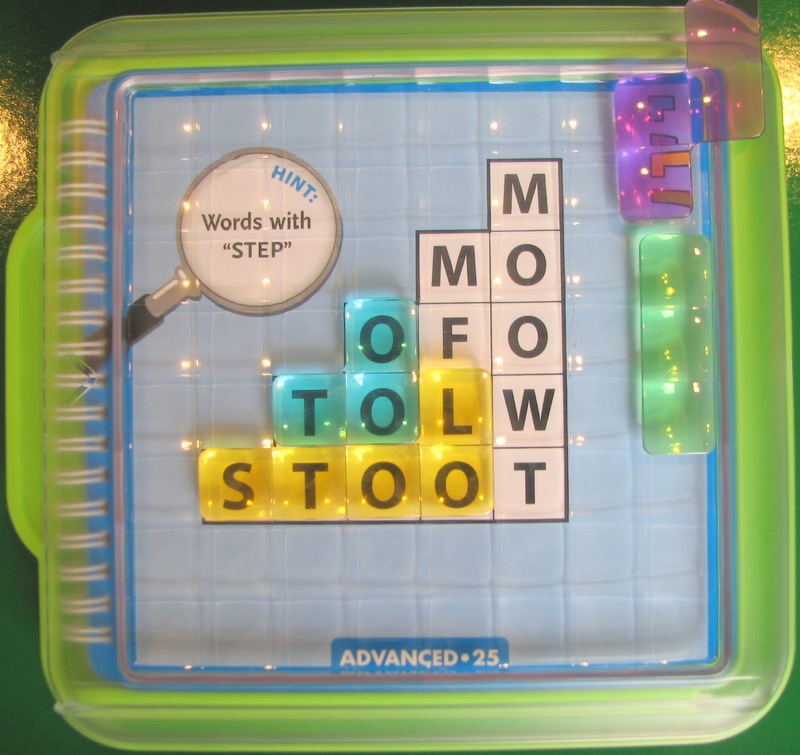 The Junior version has hints which is usually a word or a picture that suggest a theme for the words to be found. Each puzzle tells you which puzzle pieces to use which is great because it is a prep skill that I want my kids to exercise. Both are impulsive to the degree that they will ignore that free clue which can be pretty important later. As I looked at the puzzle, I had a strong inclination that Number 1, who is 8 years old, would not be able to resist those pretty pieces. The other plus factor was that word searches are still okay with him. However, none of his Think Fun puzzles are about words and so I was a little scared to give it to him. So did he stay or walk away? Luckily, when he saw the box, he was not only interested, he was excited! He opened it up and started solving the puzzles right away. As with Swish, it was obvious again that design can motivate visual-spatial thinkers like my little guy. It's a different form of encouragement but it can be very helpful. What Skills Are You Sharpening? I was happy enough that Number 1 was playing with anything related to words because he is more of a kid who likes toys that are Legos or Lego-like, have buttons to shoot things, or have a remote control. But even though this puzzle is full of words, I had to ask, is there learning really going on here? 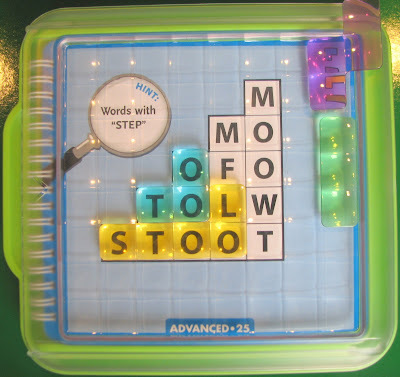 Your child will find words that may not belong to the puzzle. They have to figure out what the right words are in order to make it all fit. Veteran learning specialist and child development expert, Susan Schwartz, MAEd, Director of the Child Mind Institute's Learning and Diagnostics Center in New York City was kind enough to enlighten me. 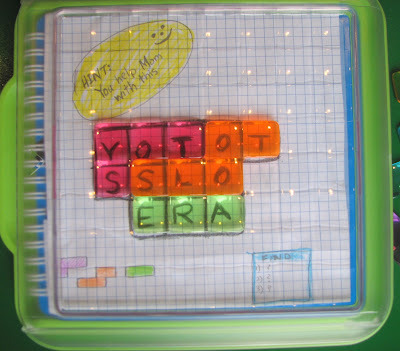 Susan said that the first thing kids are learning here is visual word recognition. Additionally, she said that they were learning flexibility. Flexibility? I didn't expect to hear that. "Flexibility is an important cognitive skill," said Susan. I never really thought of flexibility this way. I had only viewed flexibility as something that was needed to change cemented kid-habits such as, "Instead of fries with your burger, how about carrot sticks this time? Come on, let's be flexible and try something new." Could flexibility be used to improve one's ability in the world of words? Susan explained that flexibility is required when kids are trying to sound words out, to look at them in different ways, and to even do some problem solving when they are reading. This made sense! In puzzle #6, my son had to identify the spelling of sounds that animals make (MOO, QUACK, OINK, BARK). He was stuck on "BARK" forever because he kept looking for the word "WOOF." Maybe that is what is meant by learning flexibility. This is what #25 looks like when it is completed. The child had to decide that "TOO" was not an intended word. Found the words? Good, but do you know what they mean? Susan also mentioned another learning opportunity with puzzles that I didn't stop to think about because I encourage him to play these games on his own and only become involved once he shows signs of trouble (ie. stopping and never playing again). 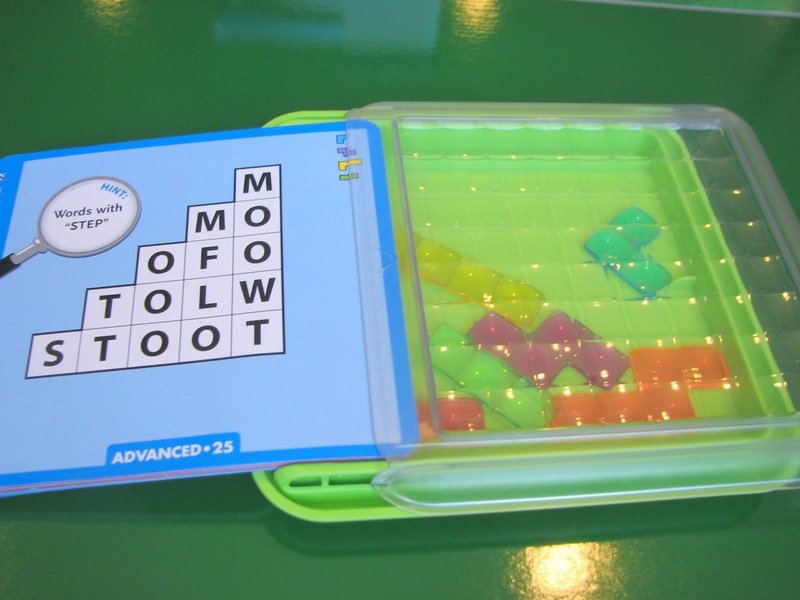 For Susan, she believed this game required prior knowledge of these words and said that it was an opportunity to work on vocabulary development. As she described one of those teaching moments with a student she said, "we looked at a picture of the desert and we talked about what animals we could see and then what kind of words could be desert-related. I wanted to make sure that I wasn't just giving him the four words that he needed to find." After our talk, I went back to the words in the puzzles that he had already completed and I realized that he probably did not know a couple of these words or may not know them in relation to the clues given by the puzzle. 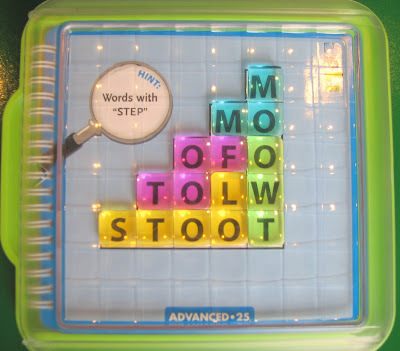 For example #25 gives the hint as: Words with "STEP" The words were MOM, TWO, STOOL, and FOOT. 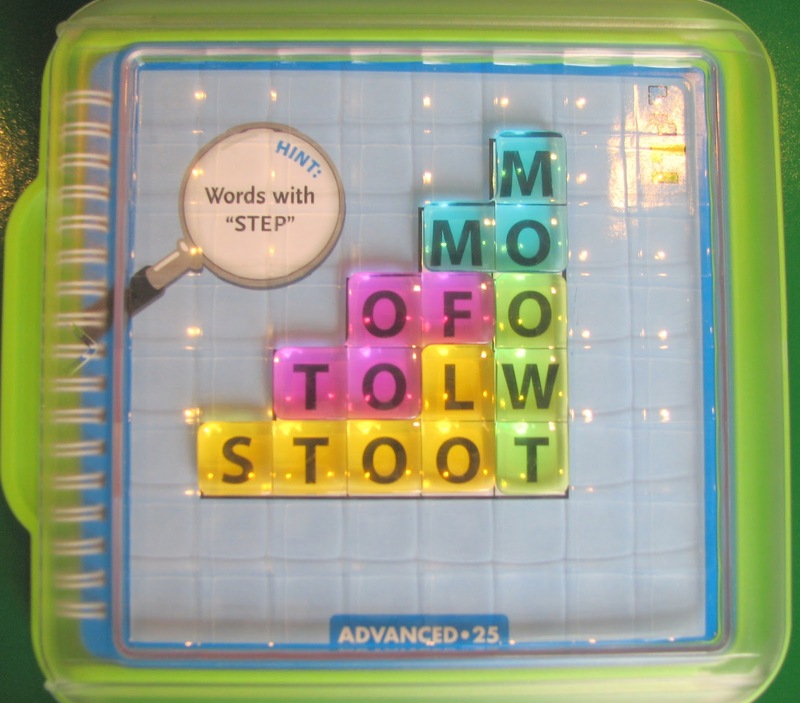 For my Number 1, he might know some of these words and its relation to the word "STEP" but I highly doubt he'd know what a "Two-Step" is. Wouldn't that be fun to look-up? He just completed #24, I almost missed this opportunity. Thank you Susan! Inside the puzzle, I have Number 1 keep track of the puzzles he did. It goes up to 40 but I told him to just list up to 16 to prevent overwhelming. 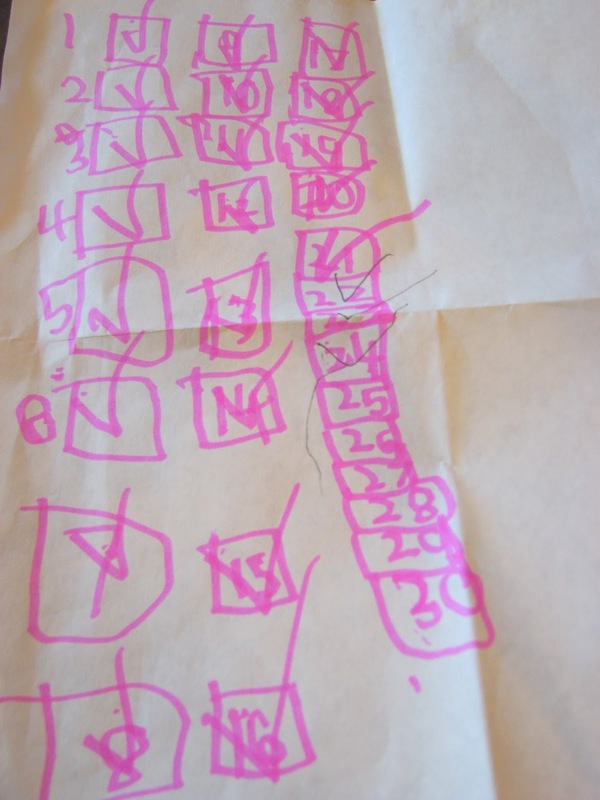 He made more checkboxes as he progressed. As I looked over the puzzles that my son completed without me at his side and thought about vocabulary development opportunities that we had missed, I felt so bad! I should have figured this out when he told me that he didn't realize that SAX was a word when the puzzle was about musical instruments. He does know what a saxophone is... perhaps this is one of those times that flexibility could be exercised. Truth be told, I totally missed that clue because I am so focused on him getting through each puzzle and eventually getting to the last one (#40) to finish and therefore: WIN. Clearly, with Susan's guidance, it's obvious now that the "win" in this one-player puzzle can be defined more broadly. It's not just about getting to #40. Rather, it is about the child learning all the things that can be learned when he/she reads a word. I suppose that is the whole point of reading and I completely missed that. How embarrassing! But I think my son will forgive me because I am going to go on Youtube before he starts #25 and attempt to learn the Two-Step. Surely, I will not be very suave, but he will be entertained. As promised to Mel, a reader here, a video demonstration. Notice how the clues can help you find words, prevent from making mistakes, and also give an opportunity to teach word meanings. You must be 18 or older to enter. The winning prize can only be shipped to addresses within the U.S.. only. Sorry to my Canadian readers!!! You are always on my mind. Please follow the directions carefully when entering. * I am just starting to learn about Sounds in Motion which has a child gaining early literacy skills by using their bodies. My description is not doing it justice. Click here to view more. Disclosure statement: Toys are Tools has not been compensated in any fashion by the manufacturer or retailer of any of the mentioned products for the publication of this post. Susan Schwartz and I were both provided with one game each for our review. Reviews are never promised. The video was embedded with the permission of Think Fun. What a cool game. My son has phenomenological issues, so trying to see a word in a different direction might be too hard for him, or it might be a good challenge to get him thinking about words in different ways. This looks like so much fun! Thanks for covering it. We must have this game. Thanks for the giveaway. ThinkFun games are so great. I share my collection with our local library branch. I'm sure this would be a great addition to the collection. Thanks for the giveaway. Yvonne, thanks for your comment. That is so kind of you to share your collection. Do they take care of the pieces? It's a crazy question I love to see kids happy when all the pieces are present. Thanks for entering the giveaway. This is really cool. Jenn, can you post a short video of kids playing it? I'm short on time and a video is worth a thousand words! Thank you for the suggestion! Will do by Monday. But will not show video of me doing Two-Step. I love the combo of spelling/english skills with puzzle skills. I can see this being a great game for my children as well as for children I tutor. Thanks for the video!!! I get it now! In another year, kiddo be ready i hope! it definitely made me think! I want this for my daughter! LOVE this game! I would love to have this for my daughter. She has ADHD and this would be a fantastic visual tool for her. Thanks so much for sharing! Excellent comment, thank you! I feel like these pieces are so attractive and being able to shuffle and move them around is so stimulating. I wish I got to discuss more how I felt that a child visual-spatial strengths could be used to help with skill building here. It's such an obvious plus to me.